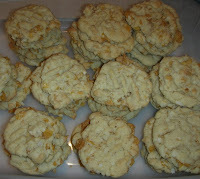 A recipe for an unusual cookie made with Corn Flakes and coconut. Source: My husband’s family has been making these for a long time. This is another unusual recipe I inherited when I married my husband. His family has made this cookie for decades, and I have never seen anything like it anywhere else. I mean, it’s not every day you come across a cookie with corn flakes in it, right? Let me start with the recipe, it’s a pretty straightforward one. I will tell you that there is no need to crush the corn flakes up. Just leave them whole and dump them in. Mix the ingredients in order, and drop them onto the cookie sheet. Honestly, I have had trouble getting these just right. When my mother-in-law makes them, they tend to turn out kind of flat, but mine never come out that way. So this time, I did some experimenting. What I am going to recommend is that you first start with very small piles of dough. 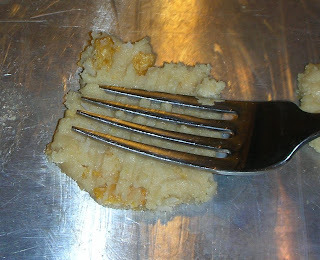 Then use a fork to smash the cookies down before baking. I baked mine for close to 10 minutes at 350 degrees. 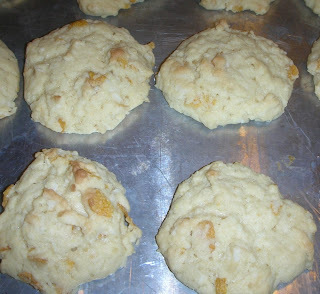 You can just bake them up without the smashing, and they will turn out all puffy and pretty. However, you may need to increase baking time just a bit, because they have a tendency to be a little underdone in the center. I really liked how they turned out when I smashed them first. They not only have that nice fork pattern (reminds me of peanut butter cookies) but they also come out quite chewy. They should be a little crispy on the outside, but much chewier than say, a chocolate chip cookie. This is a nice cookie if you are looking for a change of pace. It’s not as sweet as some other cookies, it doesn’t include chocolate, or peanut butter, or nuts. Plus, if you take this to a get-together, you will be assured that no one else is bringing the same thing! This site contains affiliate links. The owner receives compensation when links result in sales.